What is a Parenting Plan in Nebraska? 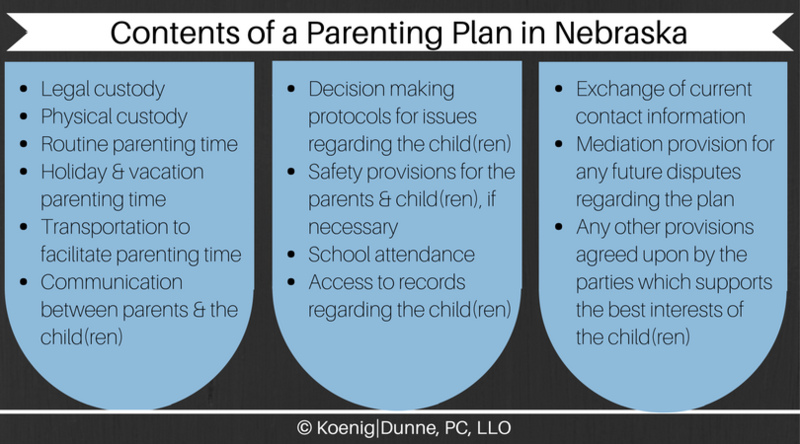 The Nebraska Parenting Act requires all parents involved in a legal action regarding custody or parenting time to have a parenting plan. A parenting plan is a document that details how you and the other parent will parent your child upon divorce or separation. You and the other parent may agree on the terms of the plan, with or without the help of legal counsel. You and the other parent may use a parenting plan mediator to reach agreement regarding the terms of the plan. If an agreement regarding all aspects of the plan cannot be reached, the court will order the terms of the parenting plan. The overarching purpose of the parenting plan is to support both parents’ relationships with their children and ensure that, despite their divorce or separation, parents can maintain, to the greatest extent possible, an ongoing involvement in their children’s lives. Once the parenting plan is finalized by the court, it is a court order that parents must follow. However, parents can agree to temporarily alter the provisions of the plan if needed. For example, parents can agree to switch parenting weekends due to scheduling conflicts. However, no temporary change in the plan will be enforceable unless an amended plan is approved by the court.